Westmont Special Events’ Westmont Cruisin’ Nights and Street Fair got off to a great start this year with about 250 cars and 2500 people in attendance. This year’s event promises to be bigger and better than ever. The 13-week event will be held on Thursday nights from 5 to 9 p.m. in June, July and August in downtown Westmont on Cass Avenue. 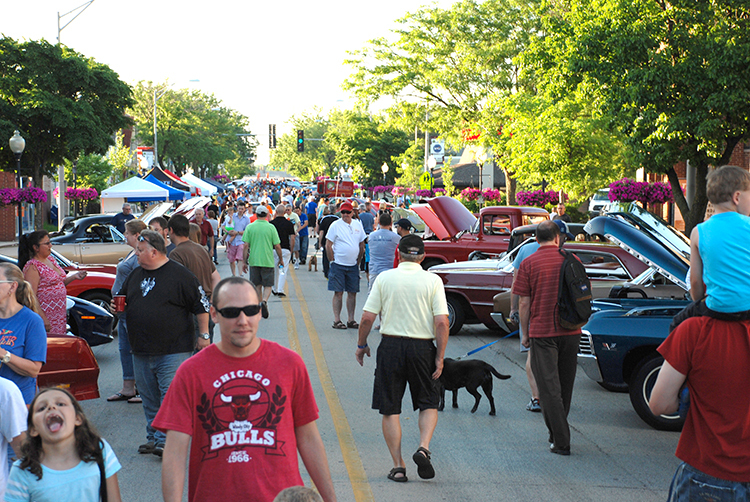 Westmont Cruisin’ Nights & Street Fair provides fun for all ages. Each week, there will be live bands, food and business specials, kids activities, and of course, three blocks of Cool Cars On Cass. Live music will be featured at various locations throughout the event on different nights. Locations will include 25 N. Cass, across from the Knights of Columbus, NEAT Kitchen + Bar at 246 N. Cass, and J. Fleming’s Absolutely Delicious, 18 N. Cass. There will be a variety of kids activities including art project by No Corner Suns and the Westmont Public Library as well as kids face painting. “We want to thank all of the volunteers who come out and make this happen each and every week,” says WSEC President John Chorney. “We always need more people, so if you’re interested in helping out, please contact our office at 630-829-9378.